It you want a walk that captures the history of Britain before the Norman Conquest, the Saxon Shore Walk is exactly what you've been looking for. Running from Gravesend to Hastings, it doesn't always hug the coastline as it is today, but follows the ancient coastline, before Romney Marshes. With the majesty of the White Cliffs of Dover, and the forts the Romans built, all the way along to the place where the Saxons lost the kingdom in 1066. Taking you through 1000 years of history is remarkable in itself, but the lovely scenery of the South East makes the time worthwhile all by itself. It's a long stretch, though, and many prefer to pick up the route in Canterbury, which halves the distance to a more manageable 80 miles. Opened in 1980, the Saxon Shore Way, which takes its name from the defences the Romans built in the third century to repel Saxon invaders from Denmark. Since its inception, the route has been revamped a little. Much of the walk is quite easy, with gently rolling hills and coastal areas, so it's fine for those without a great deal of experience. However, in a couple of sections you'll find a few steep cliff ascents and descents and some greensand, so be prepared. Those are few and far between. Instead you should expect plenty of grassland, with especially good views once you're in the section overlooking Romney Marsh. At around 160 miles, this isn't a short walking holiday. But if you cut off the first section and begin at Canterbury instead, that cuts it down to a far more manageable 80 miles, which can easily be accomplished in eight days. There are plenty of small hotels and bed and breakfast places along the route where you can stay overnight, although planning and booking ahead is recommended, especially in the summer. There are almost too many places of interest, so it helps that the daily distances are short to allow time to explore. 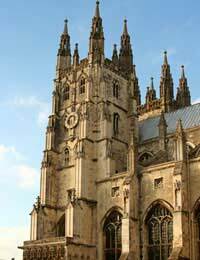 Even before you start, you should investigate the magnificence of Canterbury Cathedral. The first day of walking takes you to the old medieval port of Sandwich, for instance, whilst on the second day you cross the area where the Romans first landed (and where Christianity first came to Britain) before spending the night in St. Margaret's, up on the White Cliffs. By days five and six you're on the real Saxon Shore on the escarpment over Romney Marshes, and where lines of defence were built against the invaders; the views are quite stunning, and it can be an effort to recall that this was once the coast. From there you follow the Royal Military Canal into Rye and on the last day there's time for you to walk to Hastings (although the famed Battle of Hastings didn't take place there, but actually in Battle). However, the old town of Hastings is a lovely old fishing port and well worth the visit. Canterbury (and Gravesend) is well serviced by train and bus, as is Hastings at the other end. There are tourist information centres in cities, as well as Rye and Dover. The thing I love about this walk is the sense of history. Canterbury cathedral is gorgeous, while Hastings has a very old-town feel about it - it's easy to imagine the fishermen working there and the way the place used to be in Victorian times. The only let down is there's little sense of really old Saxon times, with nothing remaining that you can easily see. But the views do make up for that.